Support Party Up! on Ko-fi.com! - Ko-fi ❤️ Where creators get paid by fans, with a 'Buy Me a Coffee' button. Buy a ramen for Party Up! Samux and V's! We make a bunch of stuff on YouTube. Hey, welcome! 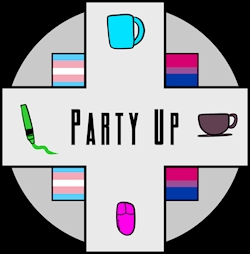 We're Party Up, a queer youtube channel mainly doing let's plays and stuff. Secured Payments. Support goes to Party Up! 's account.